Our mission is to get to know you and learn what your family wants out of their vacation. We want to be your friend first, and your vacation planner second. It takes 30 seconds to fill out our short form below to be connected with a Dream Vacation Planner. Soon enough you'll be on your way to planning a vacation with a new friend. Friendships are important to us! Choose your preferred vacation destination. What date would you like to begin travel? What date would you like to end travel? Please provide your cell or home phone number. You will only be contacted by phone if you request this. This is our "short" quote form. For a more detailed, and in depth questionnaire, please visit the main Request a Quote page. Thank you for your interest. We look forward to working with you! *All items must be checked or filled in. Let Pixie and Pirate Destinations® help you plan your next magical vacation - Walt Disney World® Resort, Disney Cruise Line®, Disneyland®, Universal Orlando Resort®, Royal Caribbean International®, Beaches and Sandals® Resorts and much more! Our Pixies and Pirates have well over 1,000 Orlando based vacations under our belts. We also have a large collective bank of travel knowledge - many different cruise lines, all-inclusive resorts and destinations such as Europe, Alaska, the Caribbean, Canada, and Mexico. Why use a "guidebook" written for the average vacationer when you can have your own go-to specialist to answer your family's specific questions and plan your personal details with you? Our Dream Vacation Planners would love to work with you to make your vacation wish come true. And best of all - there is no charge for our services! Allow us to walk you through your vacation planning step-by-step. We'll even make sure you have the best discount available. Already booked a vacation? Great! We may still be able to help! In just three easy steps you can be on your way to working with a DVP who will put YOU first. Learn more about Pixie and Pirate Destinations® and how we can help YOU. Meet our Dream Vacation Pixies and Pirates who are here to personalize YOUR vacation. Request the specifics about what YOU want and we'll be in touch with YOU! 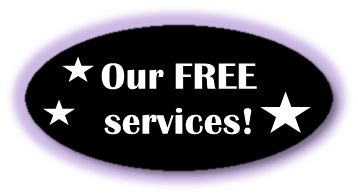 Give our FREE service a try - you'll be glad you did!